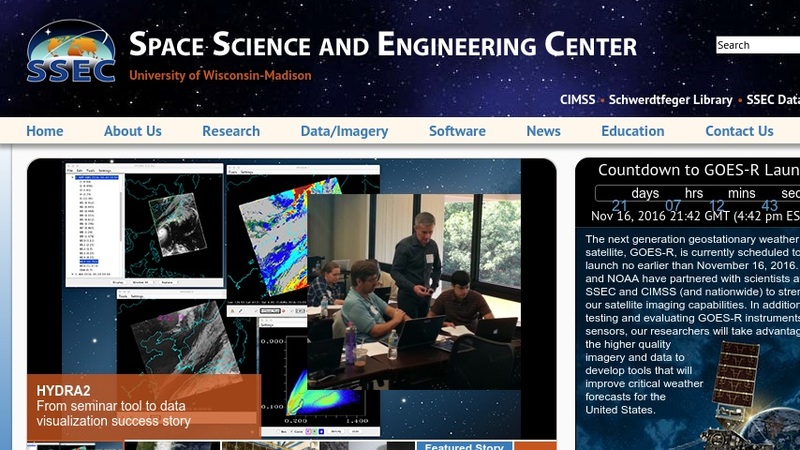 The web site of the Space Science and Engineering Center (SSEC) at the University of Wisconsin-Madison features information on Center's past and present research programs, satellite imagery, remotely sensed data products, and links to other web sites with access to imagery and data. The software page provides metadata and downloads for a variety of visualization and research software, and there is also a link to the University of Wisconsin-Madison Schwerdtfeger Library, which houses climate data sources, E-journals, resources in atmospheric science, bibliographies, and many other resources. The education and outreach page features information on student programs and activities, professional development programs for educators, and information on scholarship programs. There is also a set of links to activities, educational modules, and course materials such as applets and software.